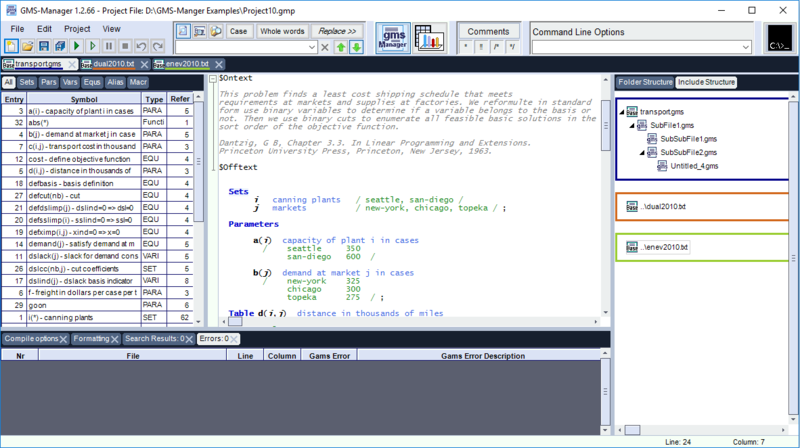 Here you can download GMS-Manager, a modern GAMS-IDE. Edit your gdx-files and increase the programming efficiency by an auto complete function, a symbol search and automatic error underlining in the GAMS-editor. If you want to see a quick guide to start your first project, please click on the tab "Getting Started". For more details about GMS-Manager please click on "Documentation". 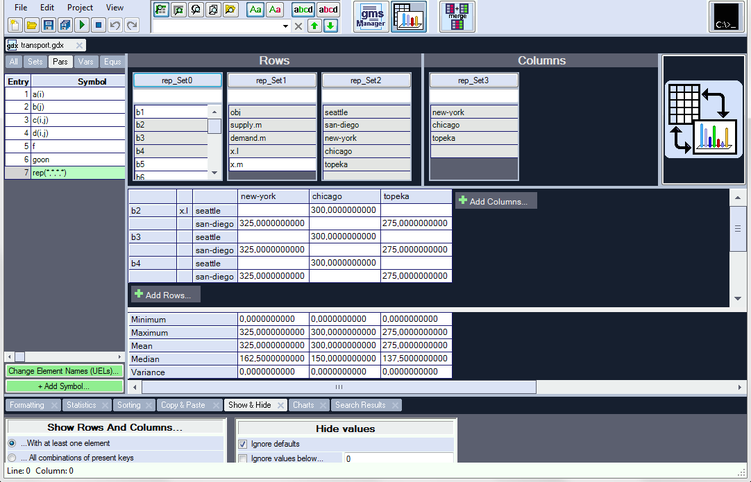 On of features in GMS-Manager is the "auto complete" function, which might make your work simpler and faster. The "symbol search" shows all places where a symbol appears, basing on the reference file. You can activate the symbol search by double clicking on a symbol in the symbol box, or you can press the "control"-button in the text window, so that the symbol is underlined and will serve as a link to the symbol declaration. The user can easily inspect all positions of a symbol in a file by activating the automatic code folding for search patterns. 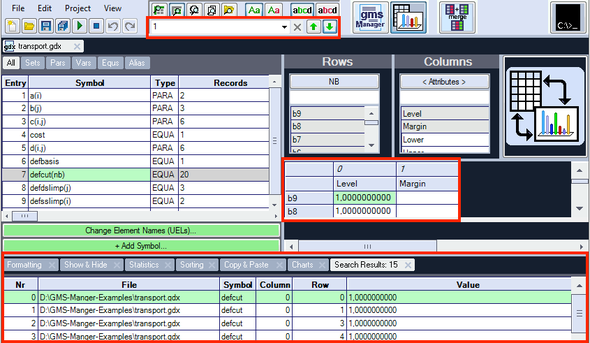 The symbol search finds all positions of each symbol and the code can be folded automatically. In the "Folder Structure" you will find the directory of the project file and the files which are situated in the sub-folders. They are marked in the color of your base files, if they are part of the include structure. Here are 2 base files, one in blue and one in orange. You can choose the file types to be shown in the tree view, for example gms-files and gdx-files. are called by the base file and its sub files. Double-click on a file name in the "Include Structure" to open the file. 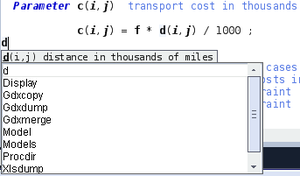 The automatic "Error search" underlines the GAMS-errors after typing. The error menu shows where to find these errors and the error description. 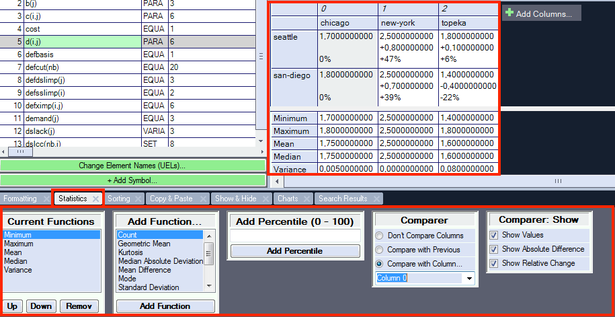 The gdx-editor shows not only the absolute values, but also allows you to compare the columns and calculates the column statistics, like minimum, maximum etc. 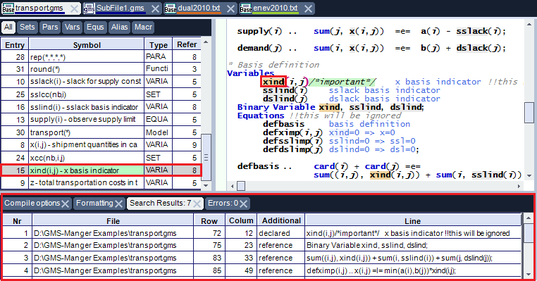 The search function of the gdx-editor allows you to search for element names in rows and columns, but also for values, symbol names and UEL (unique element names) in one or multiple gdx files. There are several chart types you can use for documentation or just for the presentation of results. 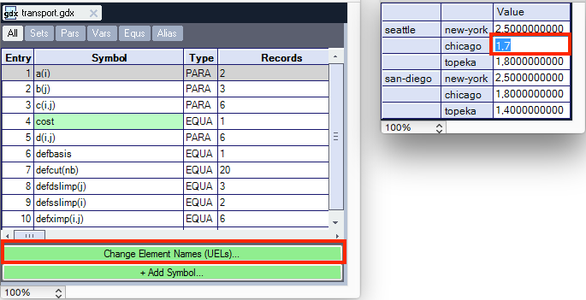 The elements names and values can be changed in the GDX-Manager. 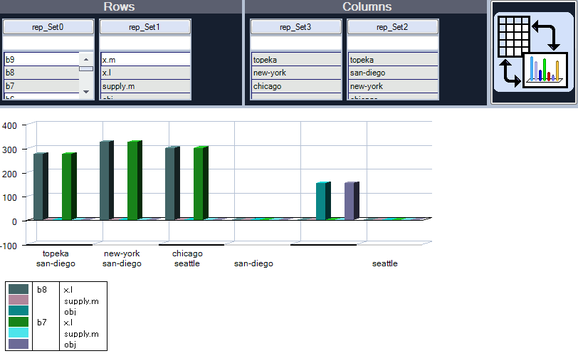 The table can be ordered dynamically and the elements to be shown can be selected for each set of your symbol. 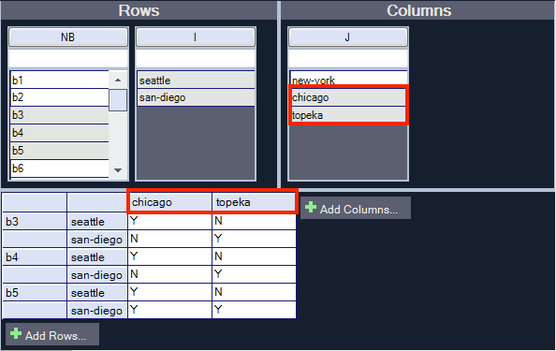 You can add rows and columns to your table, which will be accepted as elements of the sets of your symbol. including many new options and feautures for programming and editing your gdx files!